At Comfort Control, our mission is to have your home’s heating and cooling systems up and running at peak efficiency at all times. From routine maintenance to emergency repairs, to brand-new installations, every service we deliver is tailored to your unique home and its needs. 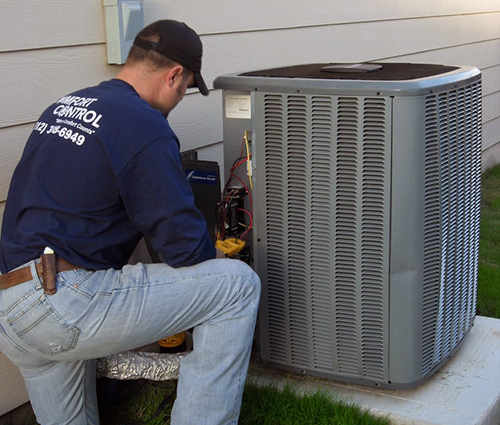 With parts on-hand and a team of experienced technicians, we’re ready to deliver HVAC services of the highest caliber! Problems with your home’s HVAC system can quickly cause issues elsewhere. As efficiency drops, utility bills rise, and if your heating and AC units falter, your comfort level will drop as well. At Comfort Control, we take pride in helping homeowners stop HVAC inefficiencies in their tracks. Our HVAC contractors in Austin, TX are skilled in tracing problems back to the source, so we can deliver solutions that are tailored and targeted. And, thanks to our extensive inventory of parts and components, we’re able to set things right on our first visit in most cases! This combination of quick resolutions and turnkey service is why our customers make us their go-to HVAC service provider. We don’t just fix heating and AC units, either—we’re also equipped for HVAC installation in Austin, TX! Our team is familiar with some of the most trusted industry brand names and can install the right unit for your home. Our service oversight also extends to other areas of your home where efficiency is concerned, such as insulation, ducts, indoor air quality and thermostats. We work closely with customers to make sure they’re getting the best performance out of their home HVAC, along with the best return on their investment. Let us help you explore HVAC solutions that are right for your living space! Contact our team the next time you have heating, air conditioning or ventilation needs. We’re a locally-owned and -operated business, proudly employing licensed, insured, Texas State-certified and registered technicians. Our team is available for 24/7 emergency services and we’ll wave the service call fee if we end up making repairs. Satisfaction is always our top priority and we strive to deliver truly unparalleled services. We want to be the company you call when you need reliable HVAC services. Our team can work with most major manufacturer models of heating and AC units. We stock a huge inventory of parts to make repairs quickly. We offer free estimates on all of our services. We’ll make sure you get a free, upfront, honest quote before any work is done. You deserve to live in complete comfort! Let our team provide you with the HVAC services you need, when you need them, to ensure your heating and cooling systems function flawlessly.